Remember that Planning Commission meeting I told you about in my last post? Well, late in the day today the agenda was amended to exclude Public Hearing #2, the first of three appeals of Sober Living Special Use permits that the commission would hear. 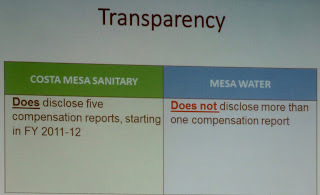 That one was yanked, with no indication why. 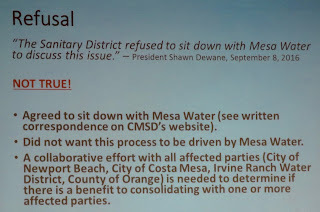 The remaining appeals are from the same appellant and are located near each other, so I suspect they may not take long to hear and resolve. 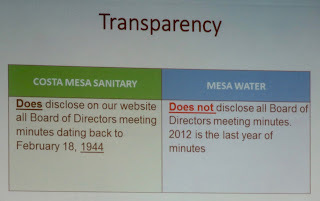 So, the commission meeting that was already probably going to be a short one just got shorter. Looks like Monday Night Football may not be a total bust. 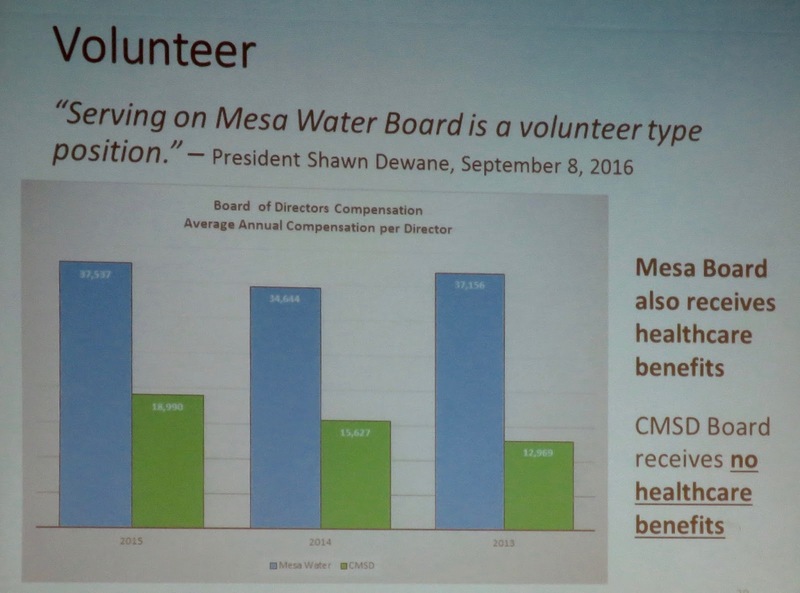 The Costa Mesa Planning Commission meets again on Monday, October 24, 2016 beginning at 6:00 p.m. in City Council Chambers at City Hall. 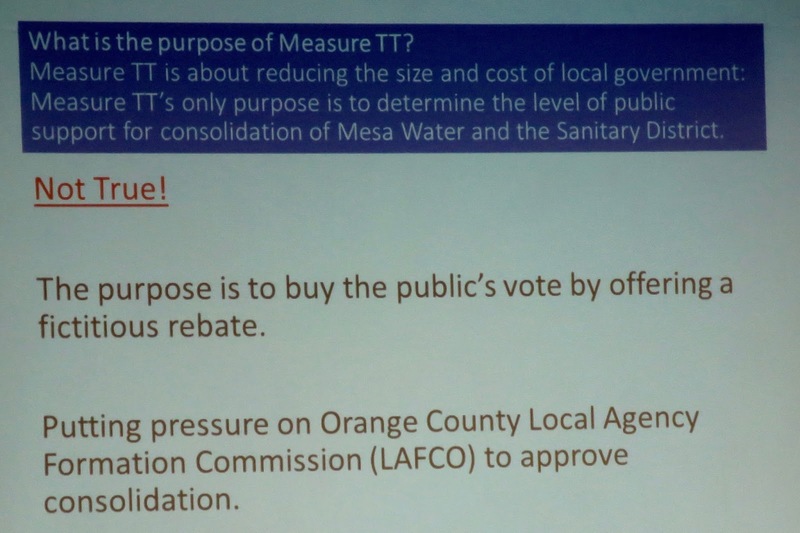 You can read the full agenda HERE. 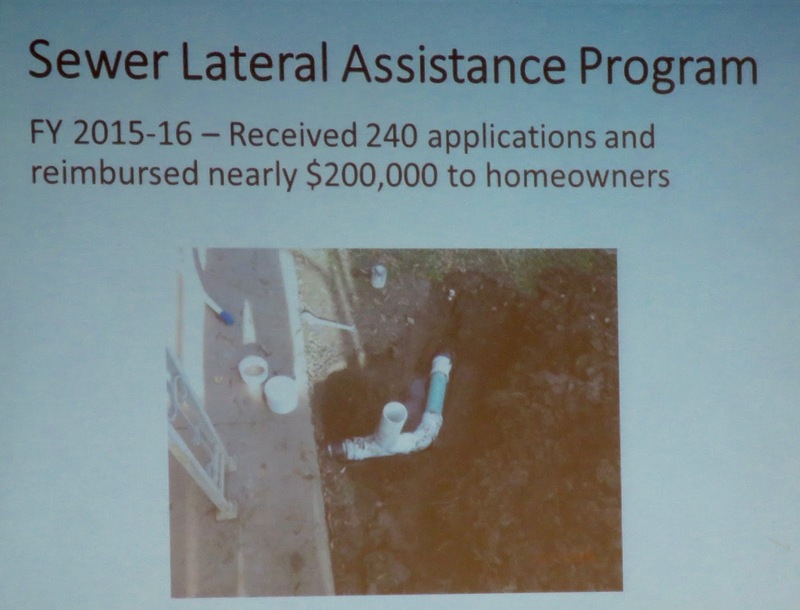 First up is the request for a retroactive one-year time extension for a planning application for the proposed new site of Ganahl Lumber at 1100 Bristol Street, right next door to their current location. 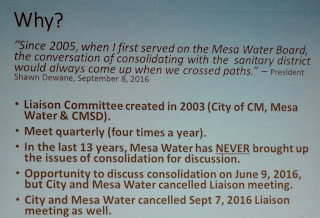 This request, HERE, asks the commission to approve a one year extension of a project they approved on February 23, 2015 and the City Council upheld on March 17, 2015. 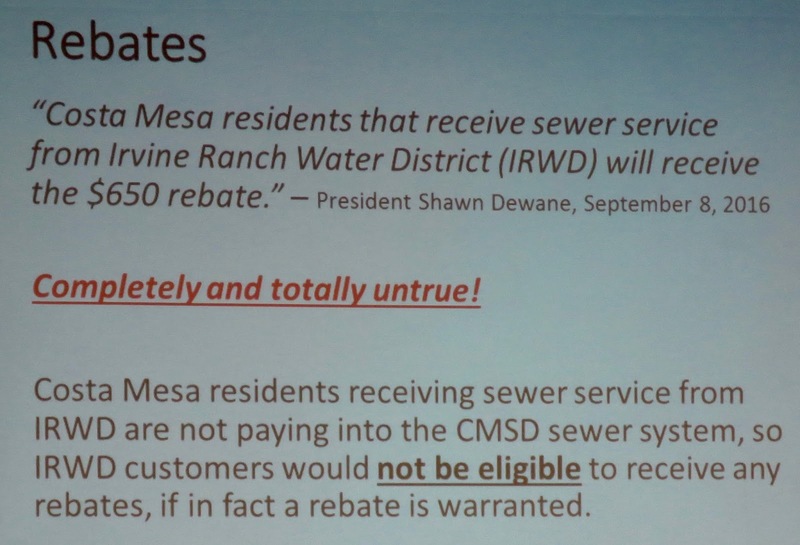 If approved the time extension would be valid retroactively until March 17, 2017. 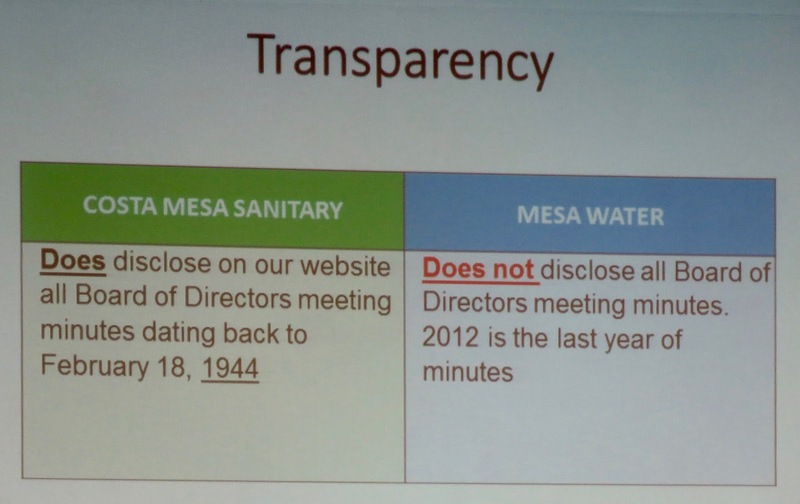 This shouldn't take long for the commission to deal with. 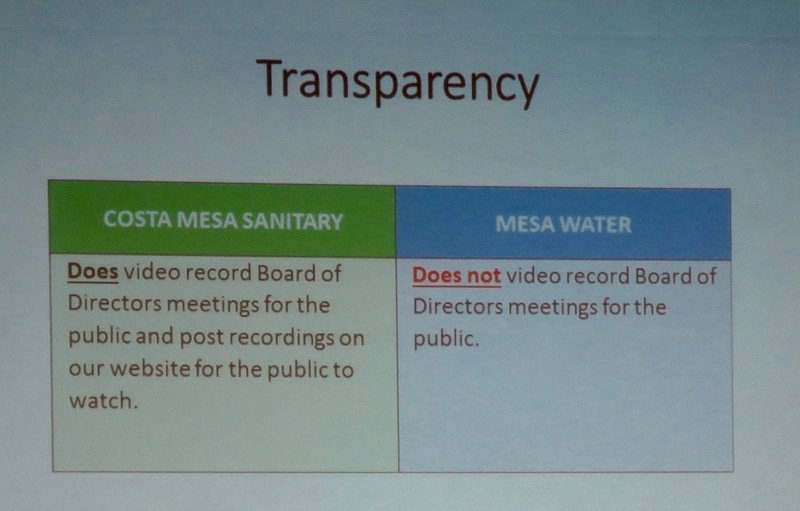 The staff recommends upholding the denial on all three of these. 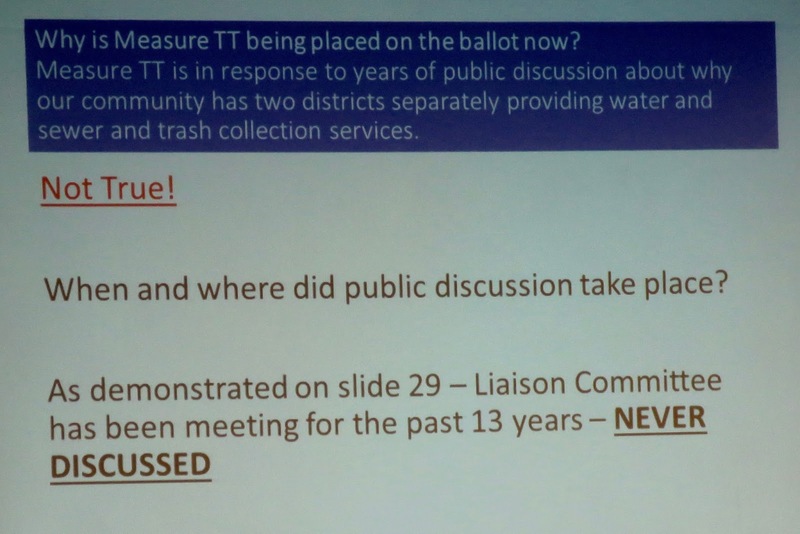 This is the first of a wave of similar requests that are heading for the Planning Commission. 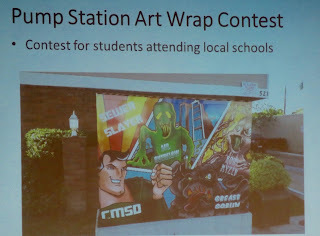 It is my understanding that the next bunch of these will hit the commission in December. 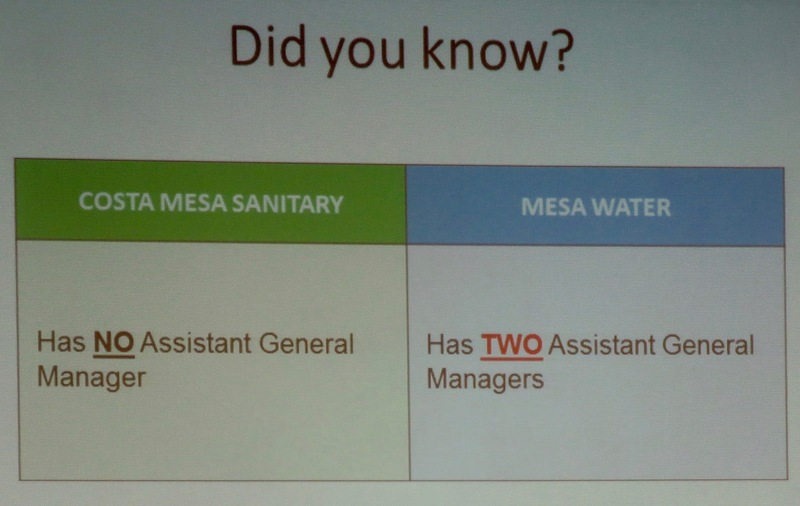 The conversation on these should be very interesting. 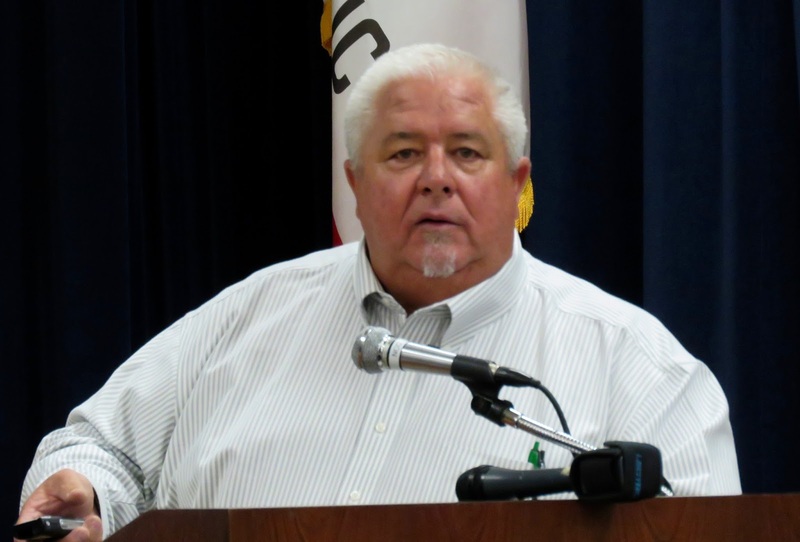 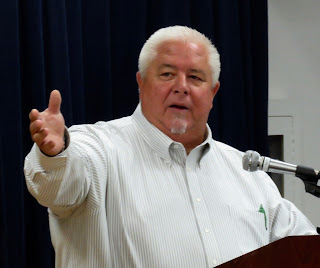 Costa Mesa Sanitary District President Mike Scheafer moderated a Town Hall last night the Neighborhood Community Center designed to inform the public on the current status of the CMSD and to set the record straight on a couple issues that have been percolating around town. 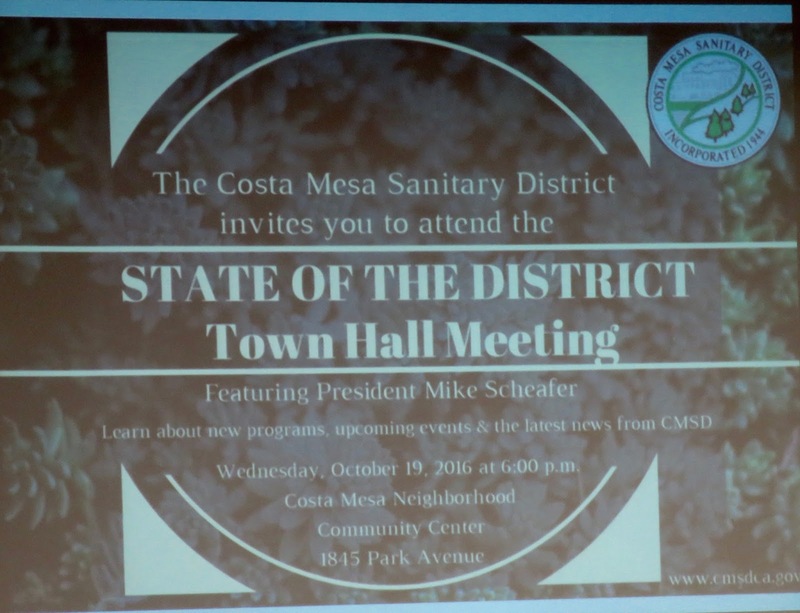 Around 5 dozen people attended this event - amazing, considering it competed with the final Presidential Debate and the Dodger playoff game. 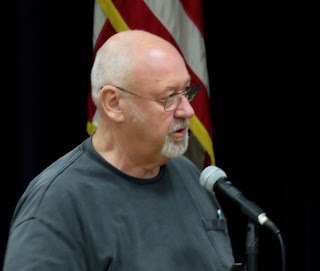 Not surprisingly, the crowd was attentive as Scheafer moved crisply through his agenda and managed to finish his segment precisely at 7:00 p.m. 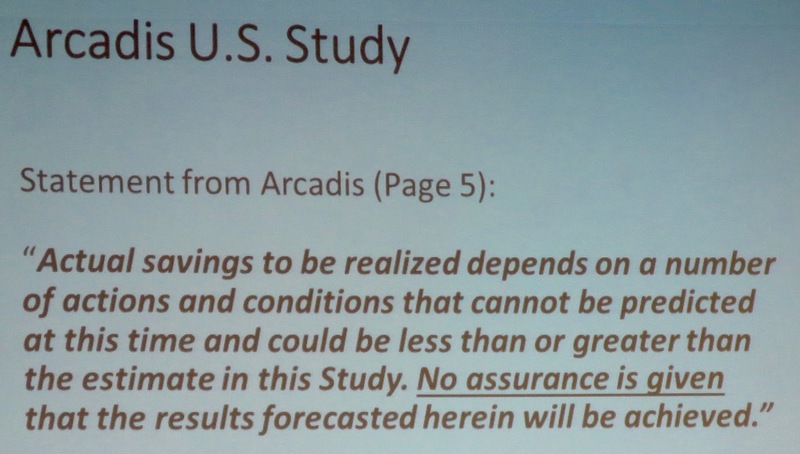 I warn you right now that this entry is going to be full of images, most of which you should be able to read without trouble. 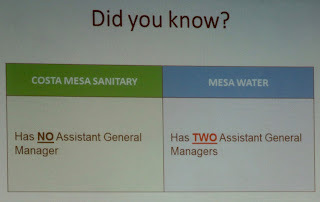 If you have problems just click on the individual images and they will enlarge for you. 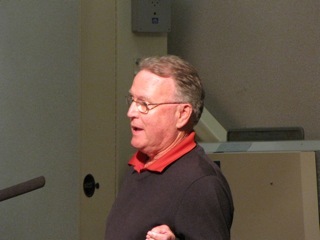 Scheafer began by speaking of the "Elephants" in the room. 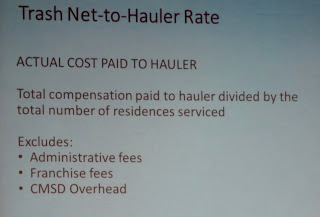 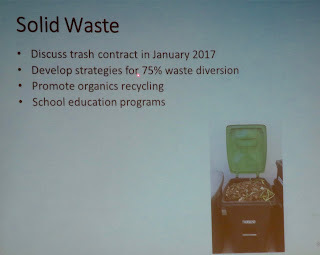 He was referring to the constant drumbeat by some individuals in the community - including at least one running for a seat on the CMSD Board - about the trash hauling contract in which it is purported that the contract hasn't been negotiated EVER. 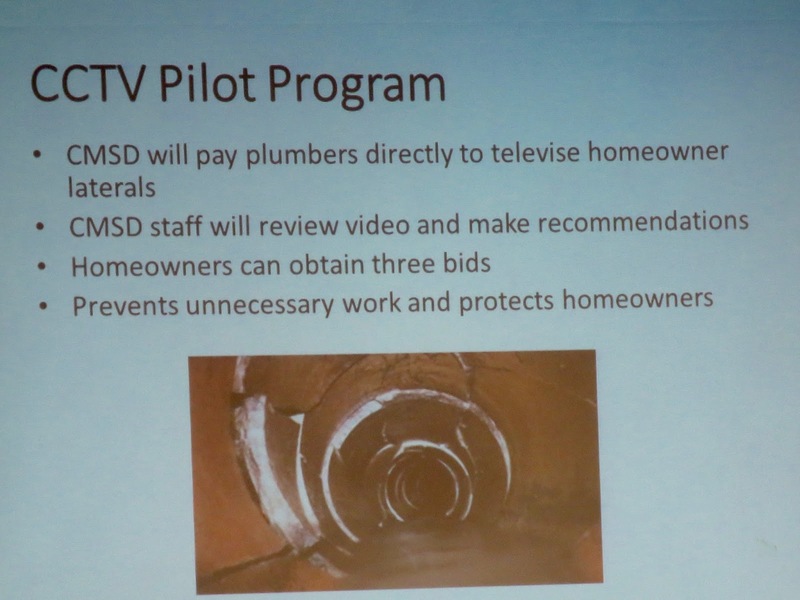 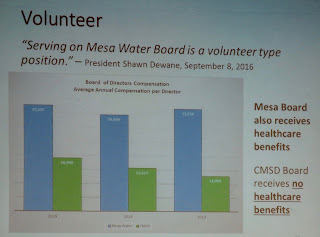 Also sucking the oxygen out of the room was the proposed hostile takeover of the CMSD by the Mesa Water District. 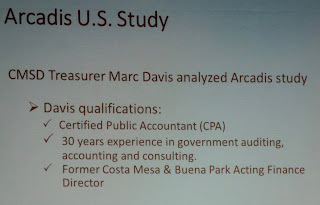 He went through each issue clearly, as I think the slides will show. 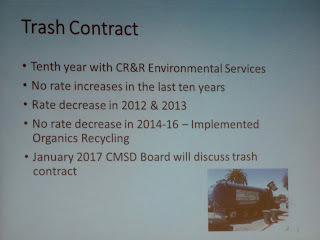 He spoke about the trash contract first, indicating that there we are in the 10th and final year of the contract with our current hauler, CR&R. 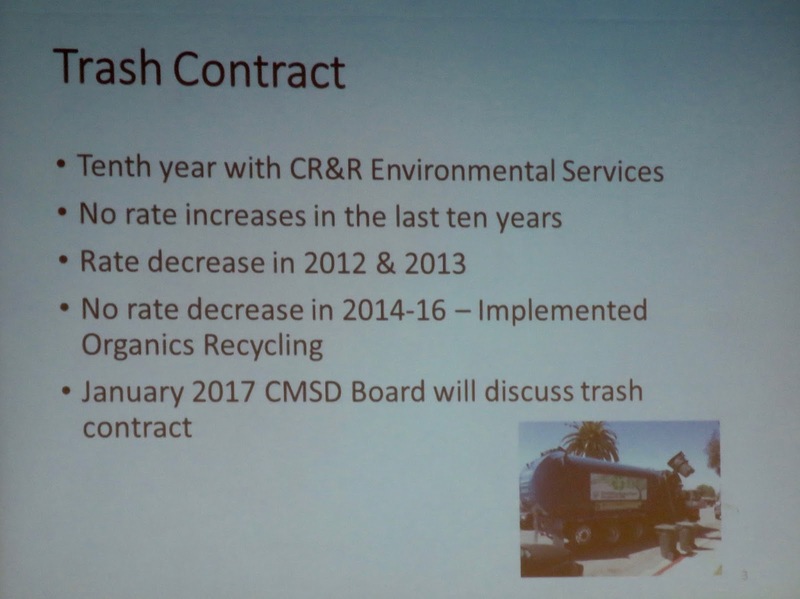 That contract expires in January. 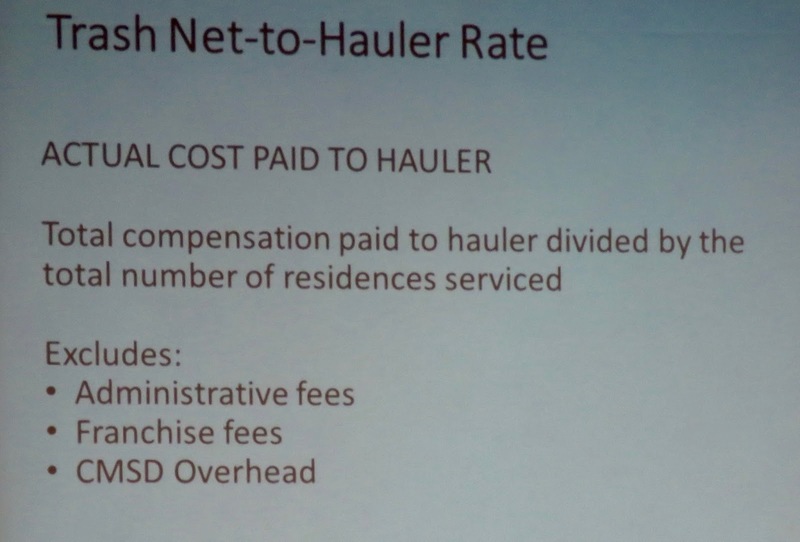 He told us we've not had a rate increase in during the duration of that contract. In fact, rates for the 2012/2013 year were actually lower than the previous year. 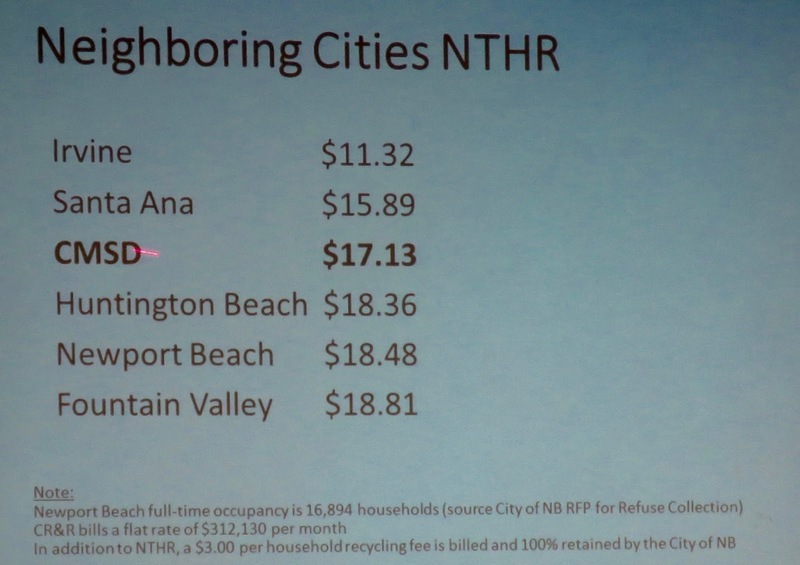 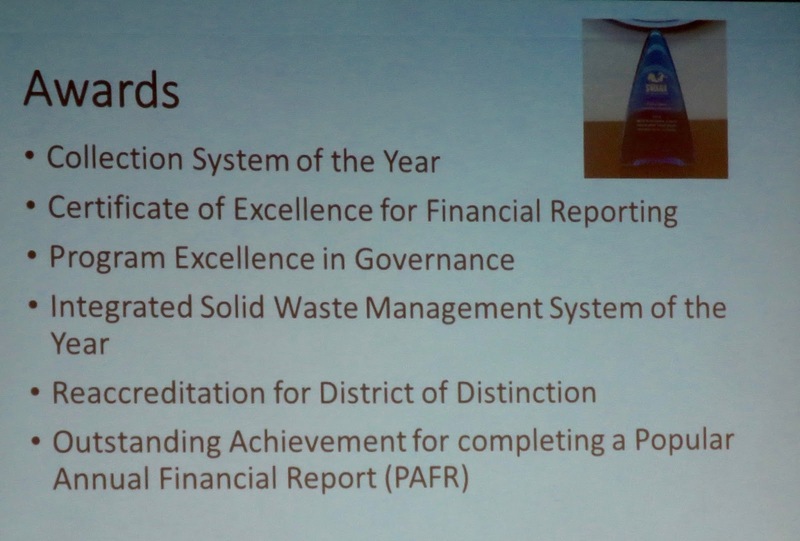 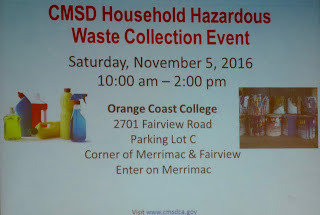 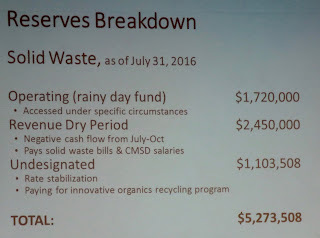 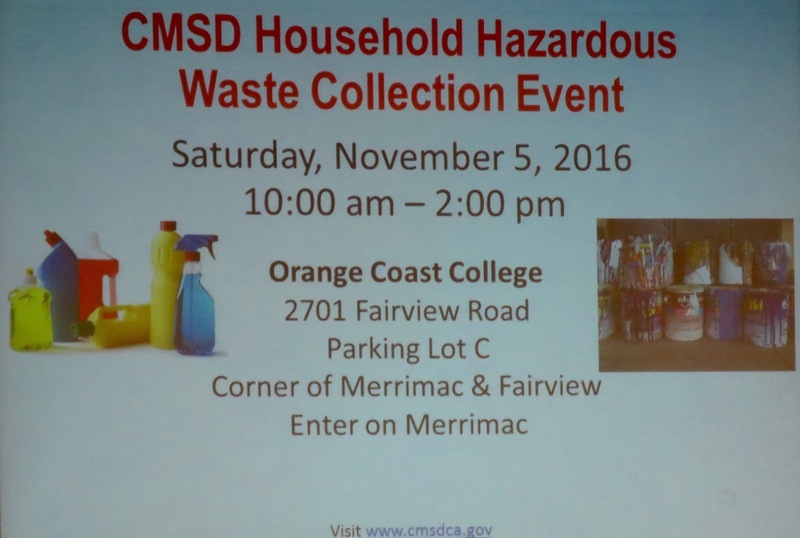 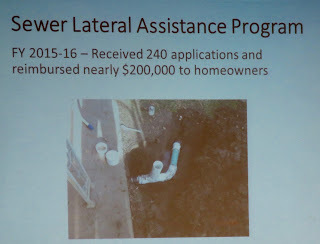 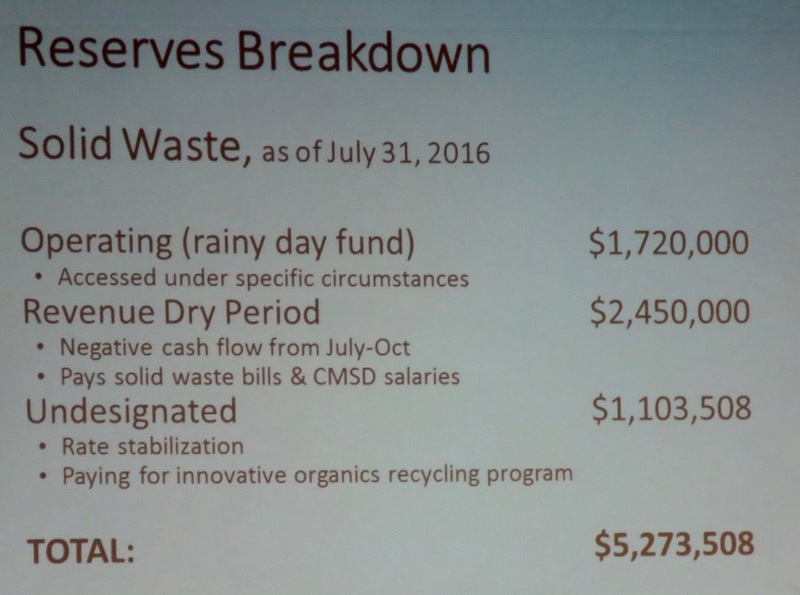 No change was made in the 2014/2015 year due to the implementation of the Organics Collection program. 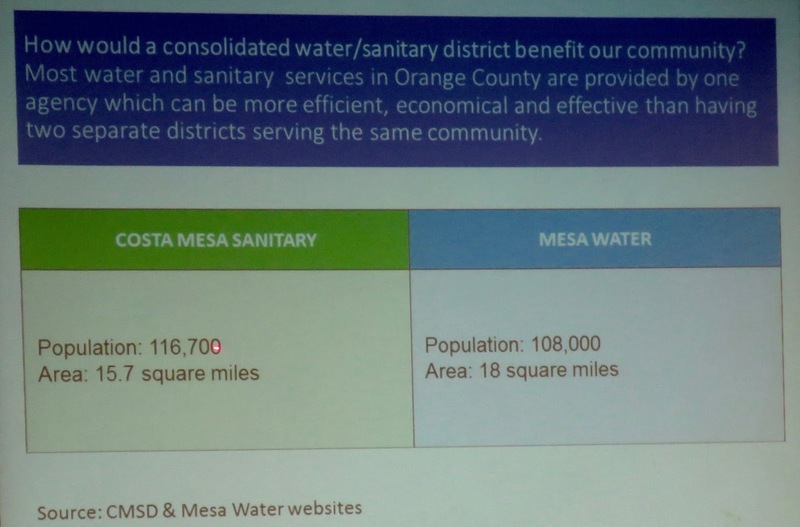 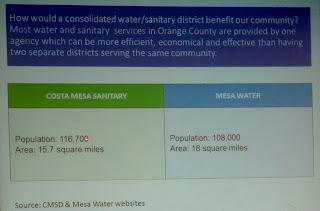 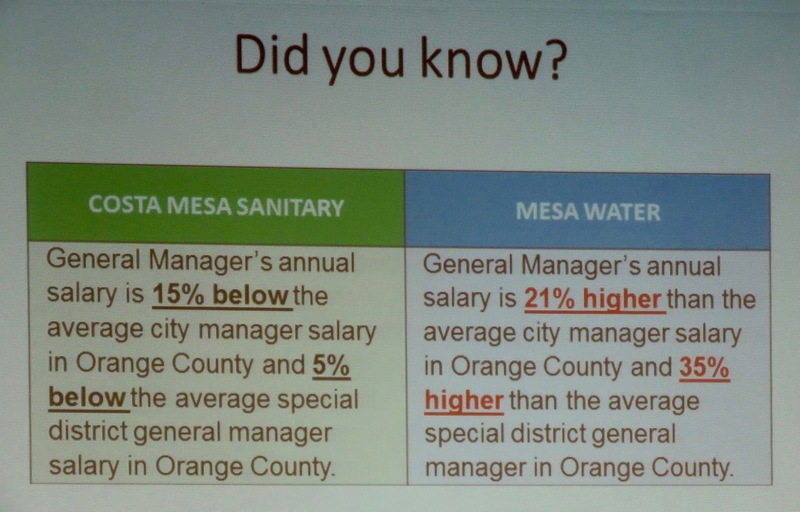 Then he addressed the Measure TT, the issue placed on the ballot by the Mesa Water District as a so-called "advisory" measure, to take the temperature of the public about a possible consolidation of Mesa Water with the CMSD. 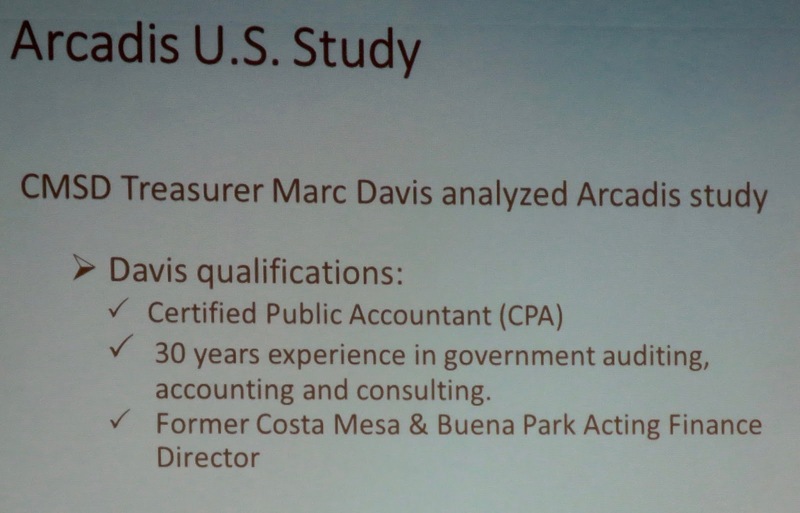 He felt the need to set the record straight, and the following slides may help sort it out for you. 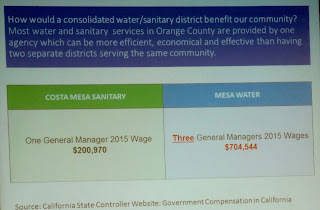 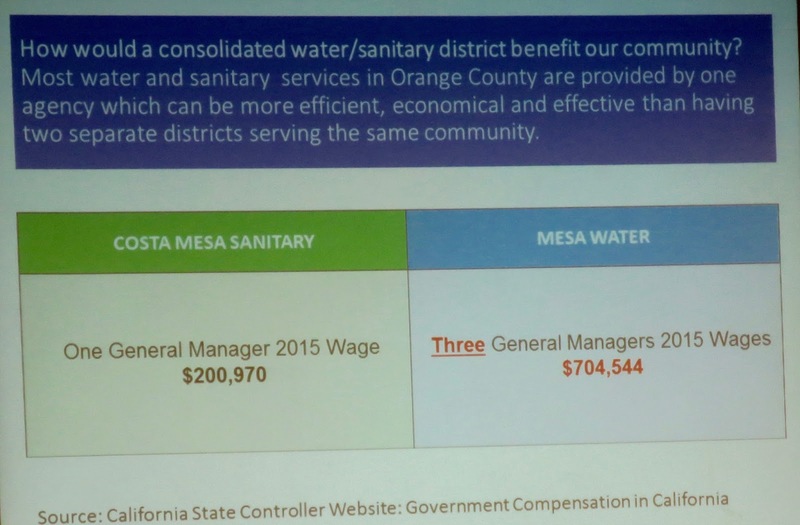 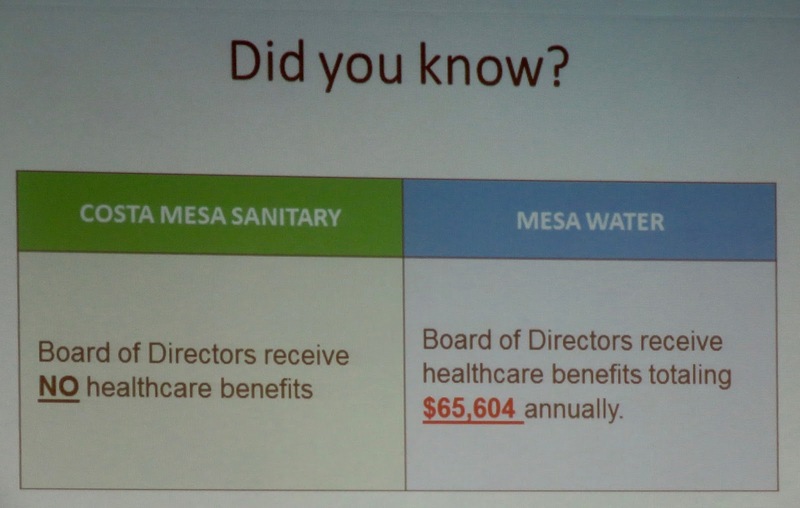 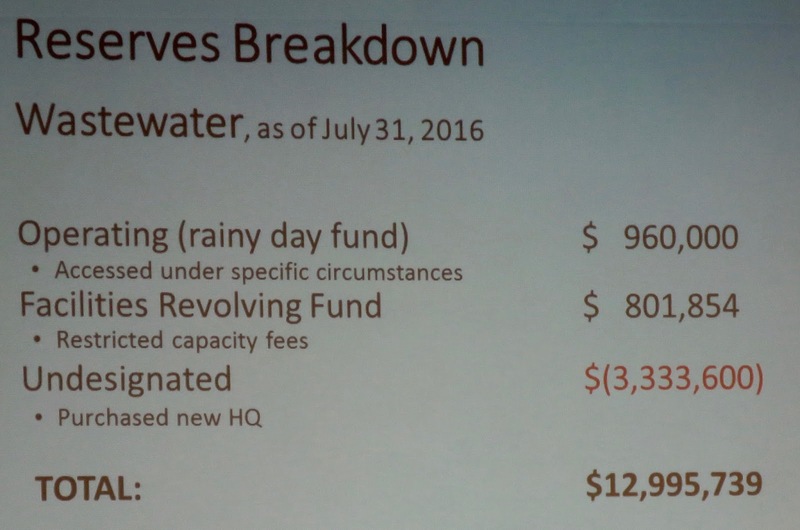 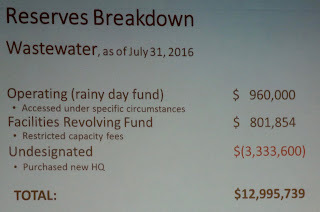 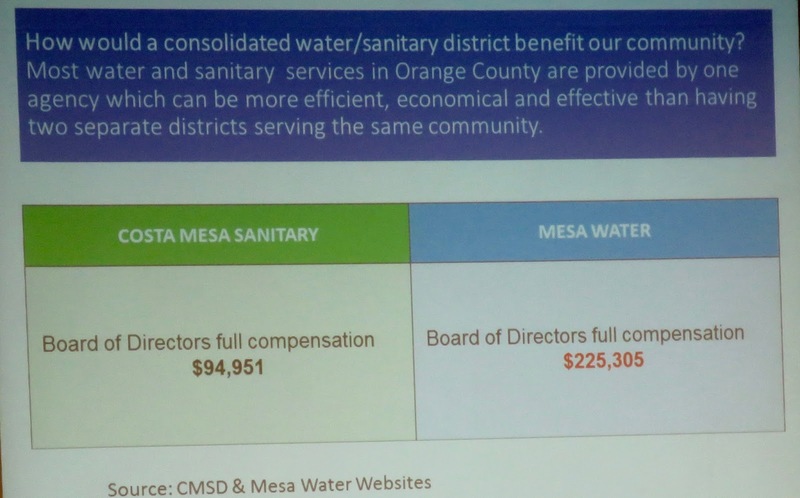 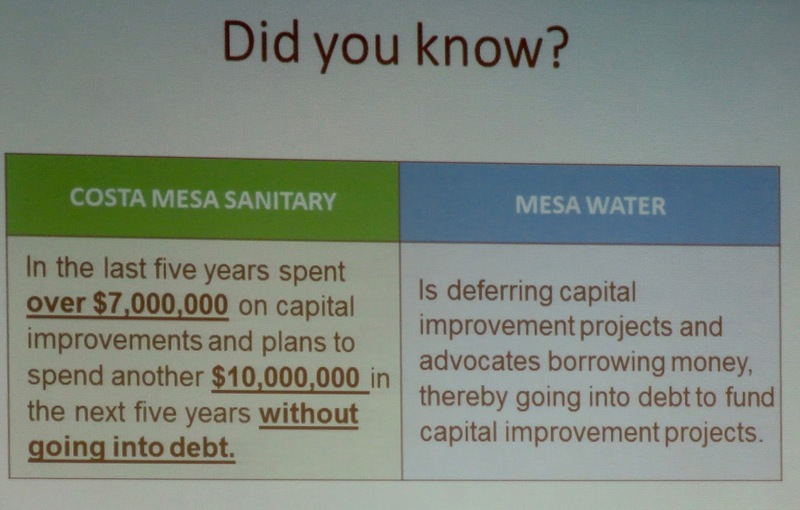 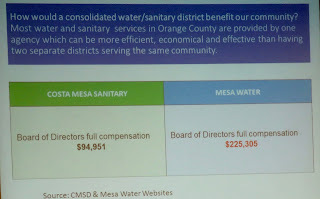 Basically, Mesa Water unilaterally charged forward without consultation with the CMSD, paid for two different consultants to gin-up some numbers until they got something that supported their idea of a takeover of the CMSD. 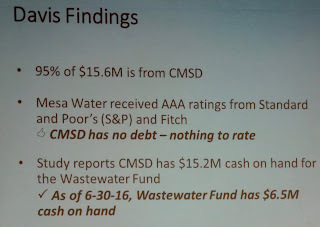 They failed to give the CMSD Board sufficient time to even consider the issue before it was placed on the ballot. 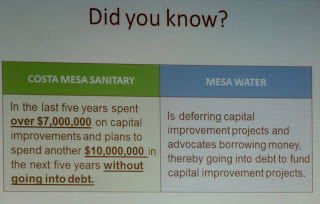 Sadly, not telling the truth seems to be in vogue this campaign season. 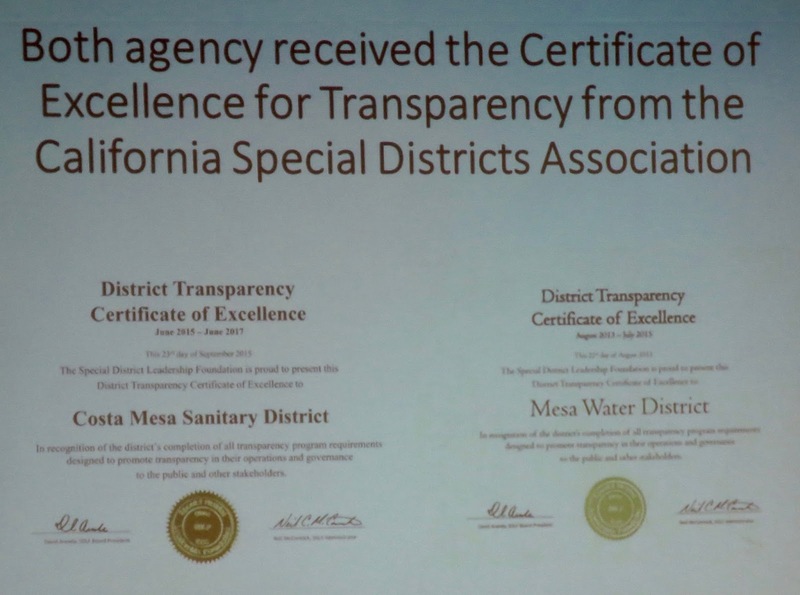 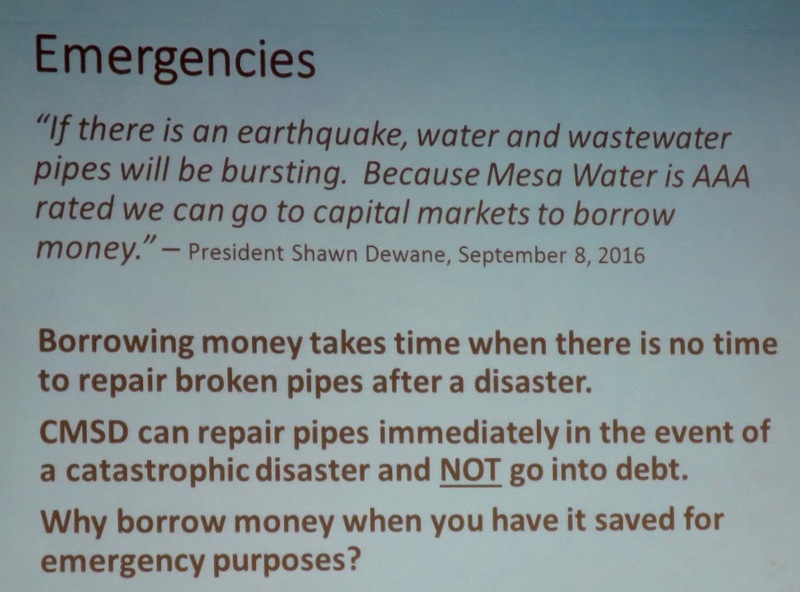 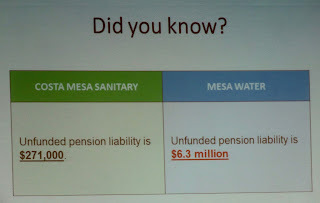 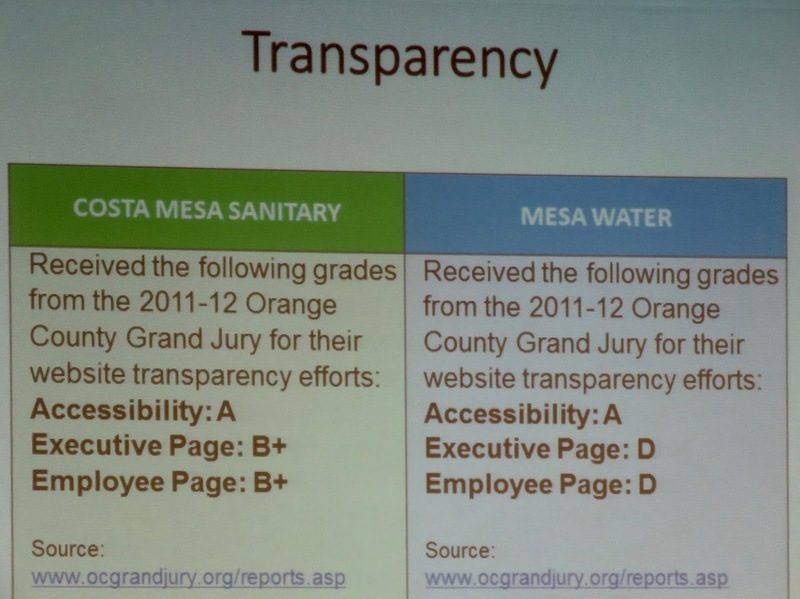 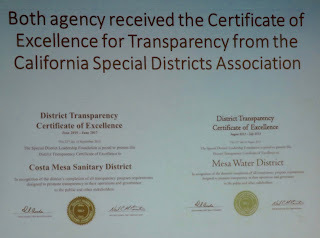 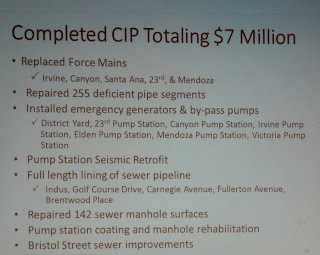 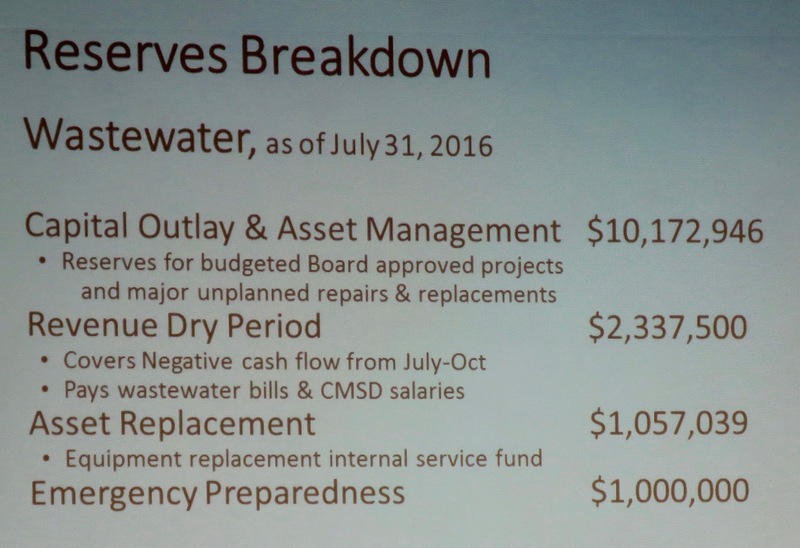 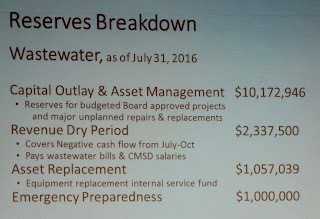 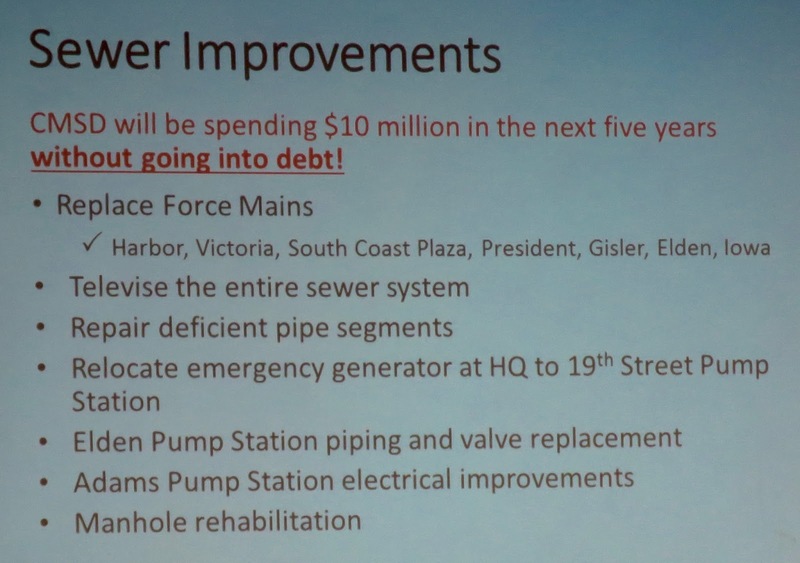 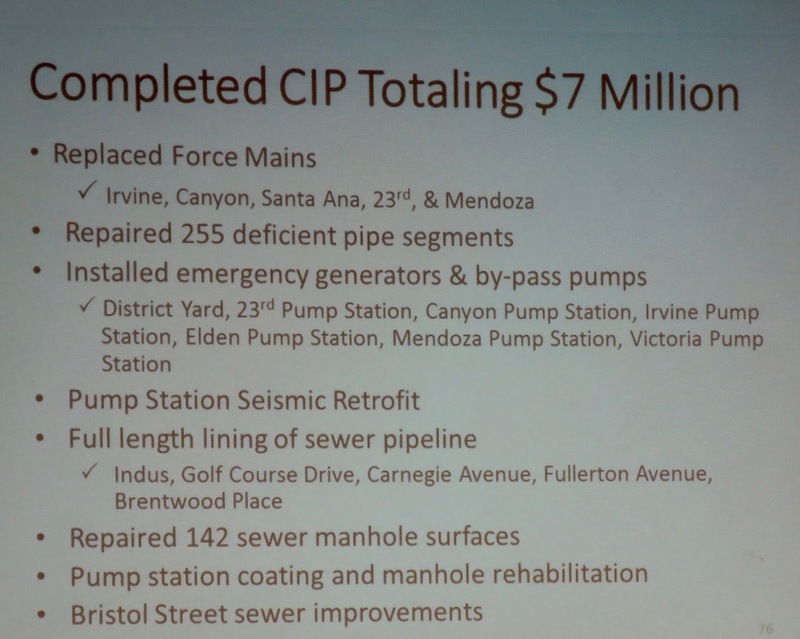 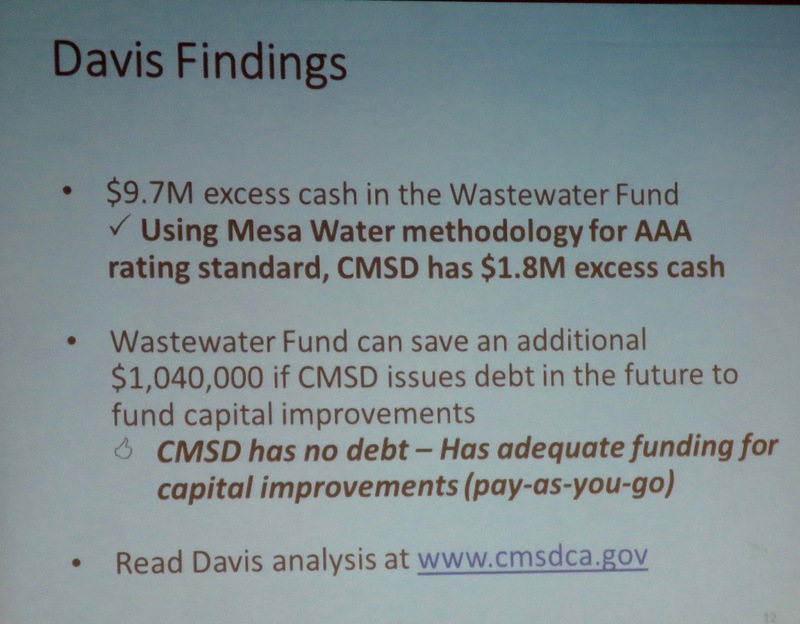 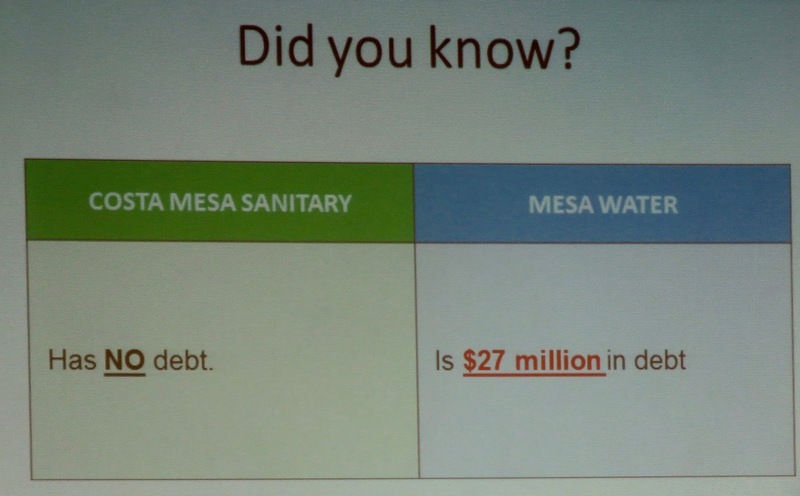 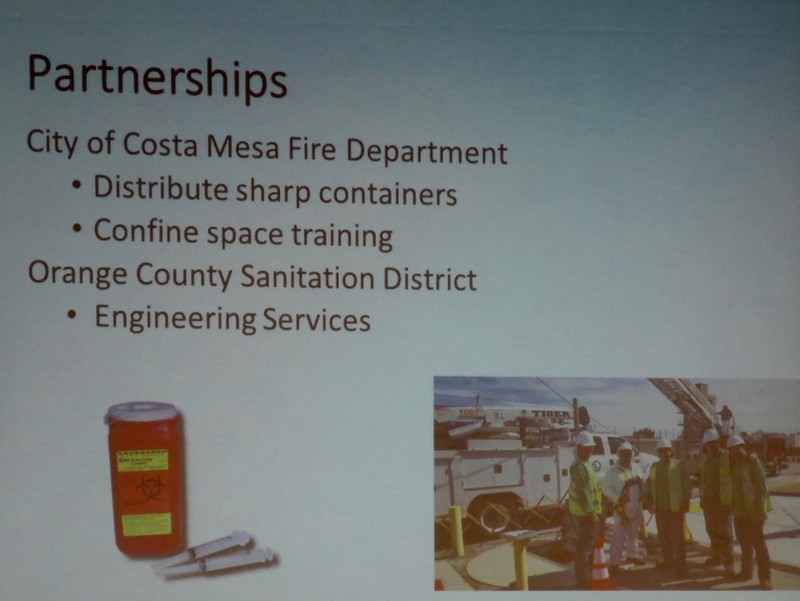 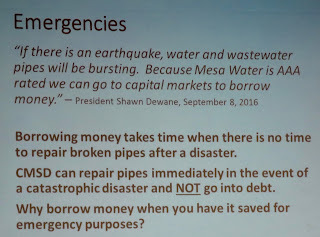 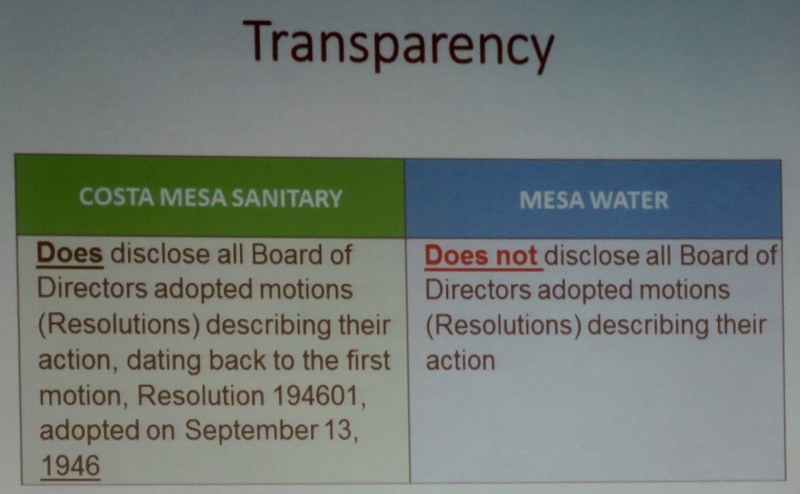 Scheafer provided slides that responded to misstatements by Mesa Water Board President Shawn Dewane at a meeting of the Tea Party recently. 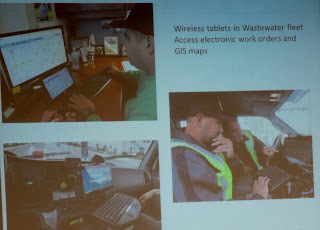 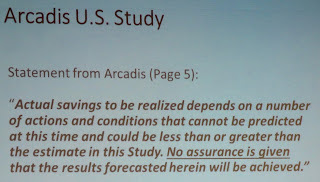 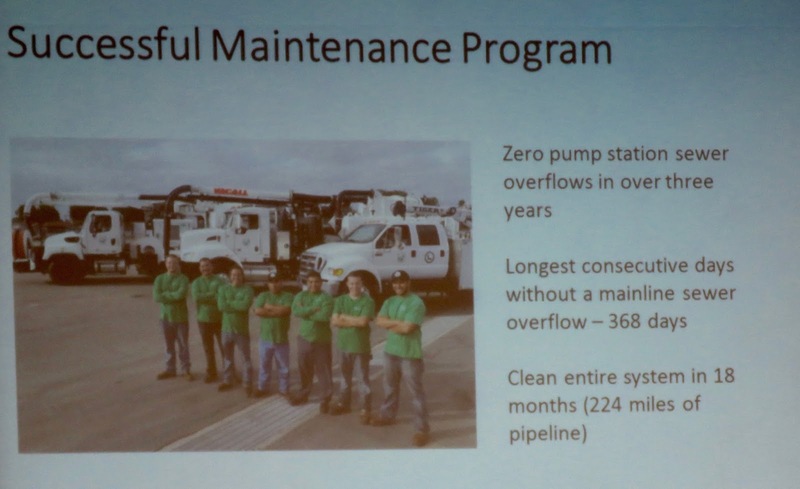 Some of the slides show those issues. 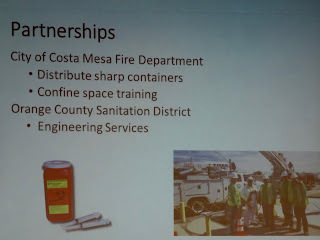 Scheafer then explained a little more about the CMSD, their programs and partnerships to help facilitate a well-run organization. 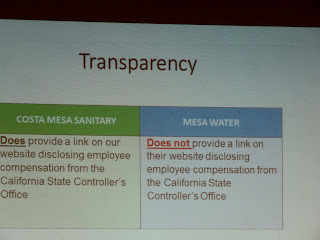 These slides will explain those features. 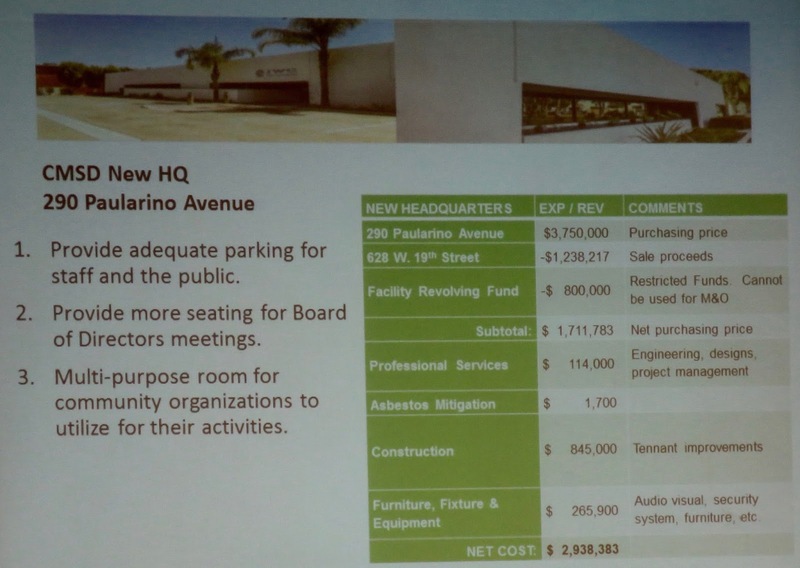 He also explained about the acquisition of a new headquarters building at 290 Paularino, replacing the existing inadequate facility on West 19th Street. Among the many new features available is adequate parking for staff and guests and a large conference room that may be made available for community events since the Neighborhood Community Center will soon be demolished to be replaced by a new Library. 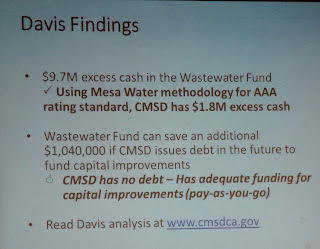 He also pointed out that, although some around town are referring to the new facility as costing "$5 million", it actually will end up costing a little over $2 million. See the chart. 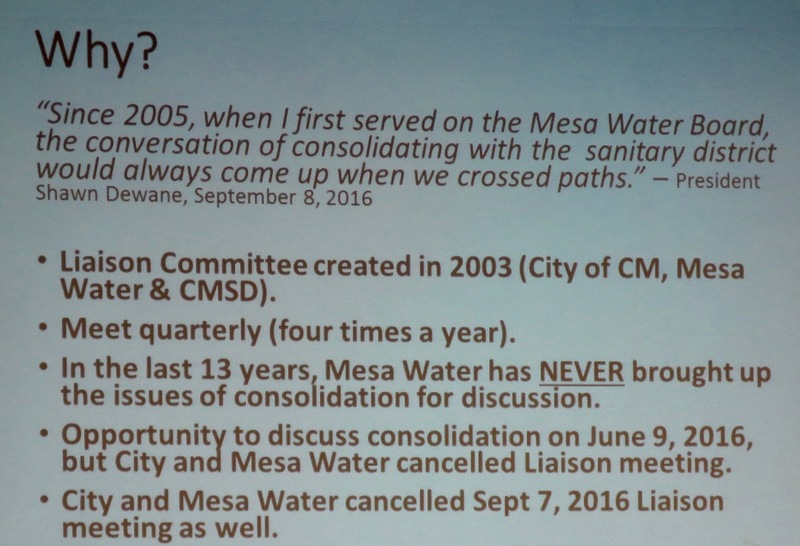 As I mentioned, Scheafer finished his presentation promptly at 7:00 and invited those with questions to step to a microphone and ask away. 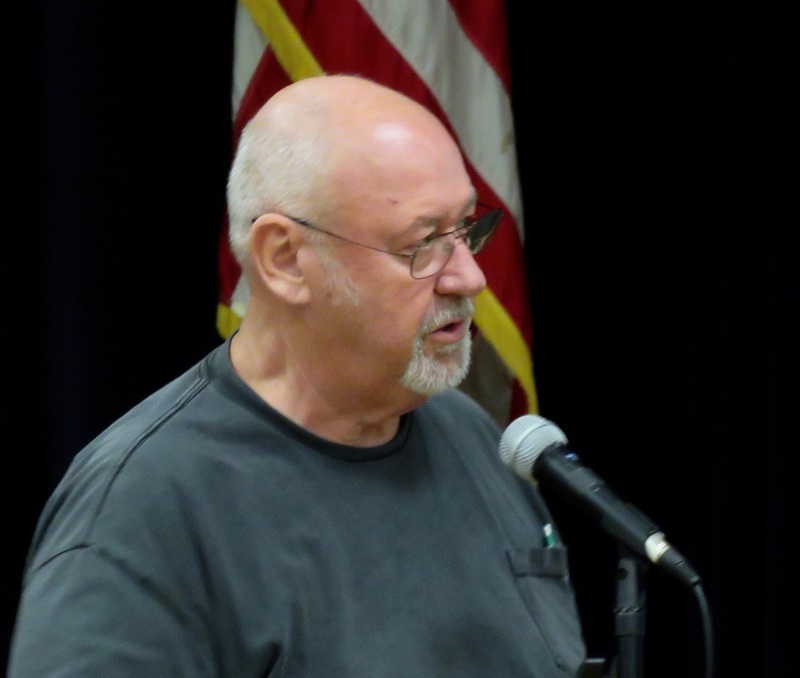 A dozen people did so, with a variety of questions and statements. Among them were: Terry Koken stepped up and presented his TiTi CaCa parody - spoken, not sung this time. 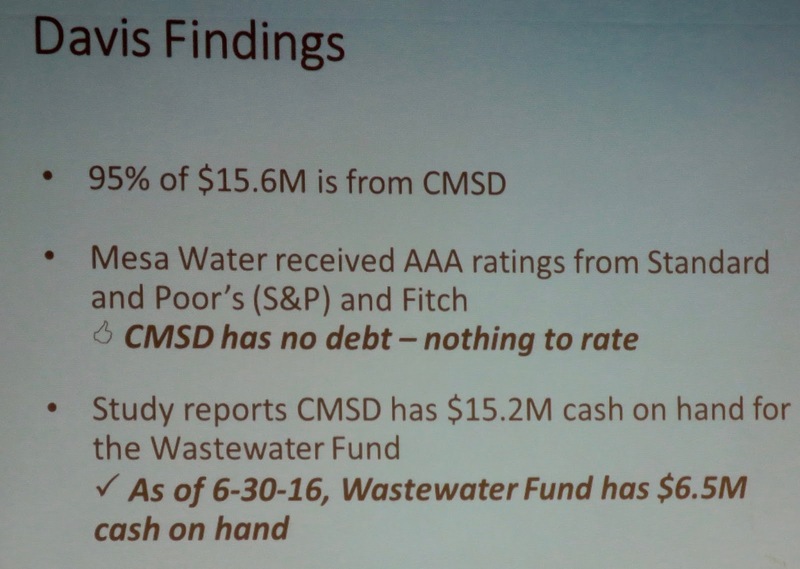 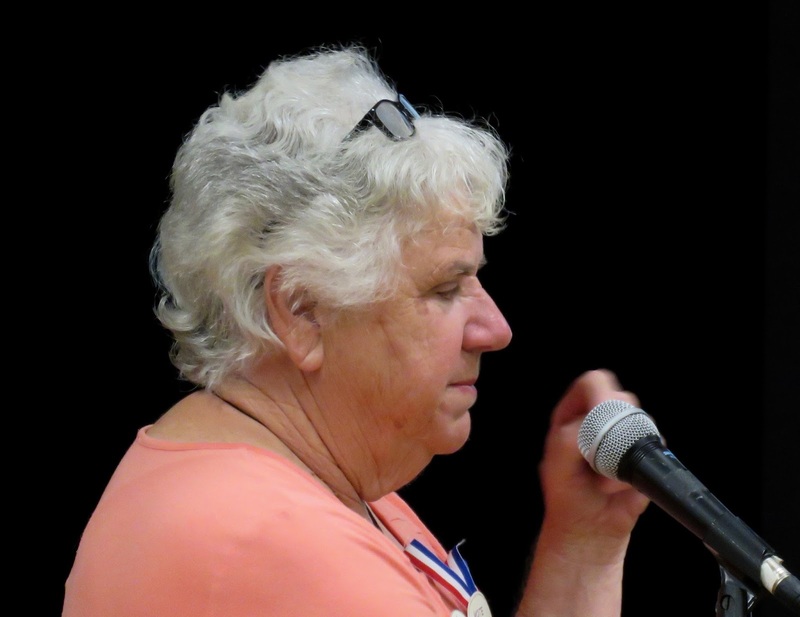 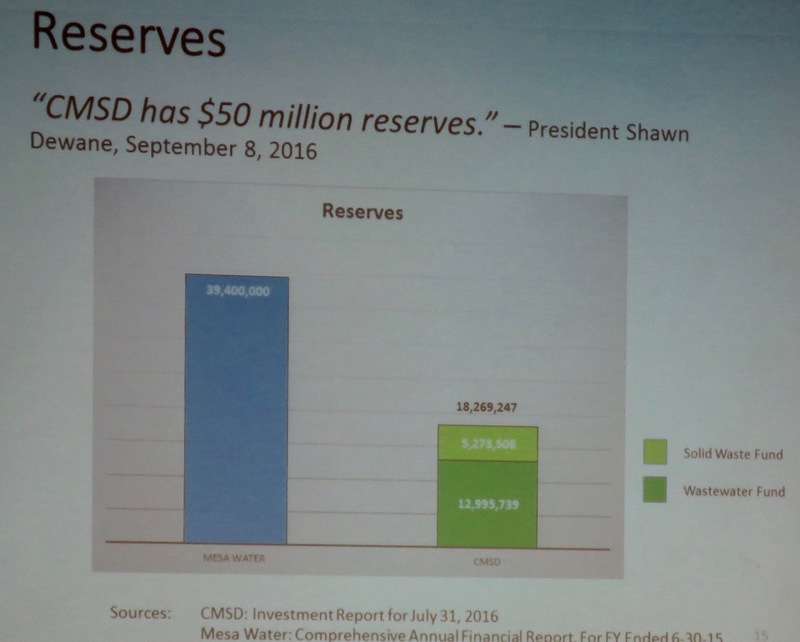 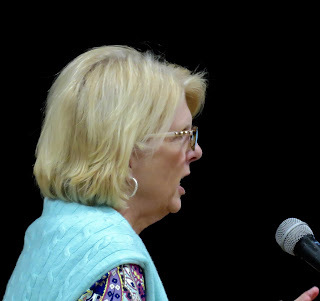 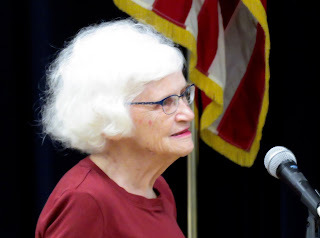 Mary Spadoni mentioned that she had attended the Tea Party meeting where Dewane had spoken and that he misled the attendees when he told them that the $650 refund that Mesa proposed would also go to the folks served not served by the CMSD. 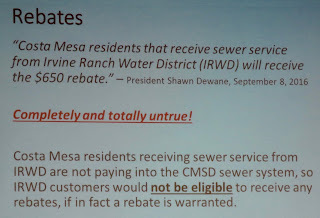 Another falsehood. Wendy Leece wondered about the wisdom of consolidation, but seemed satisfied with the status quo, with both entities running their own businesses. 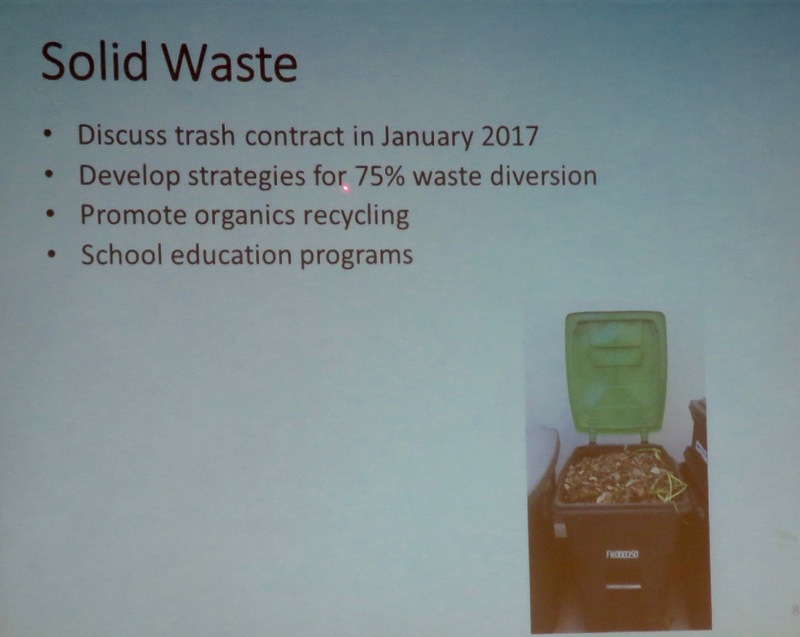 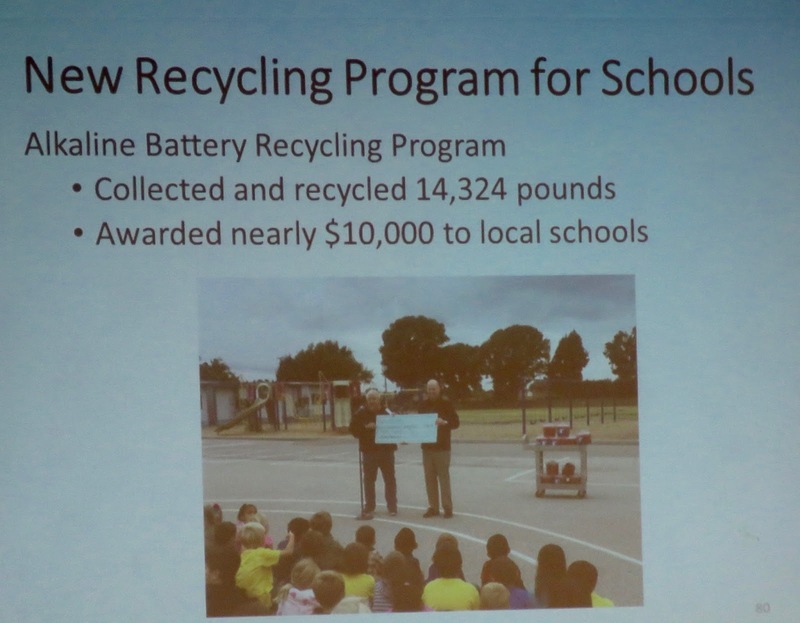 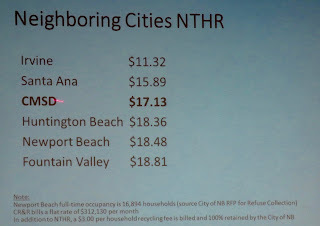 Scheafer responded to her questions by advising that CR&R is the ONLY hauler with the facility to handle Organics, and that other haulers are now scrambling to find a place for their waste. 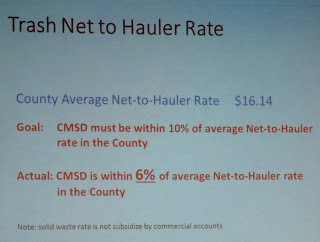 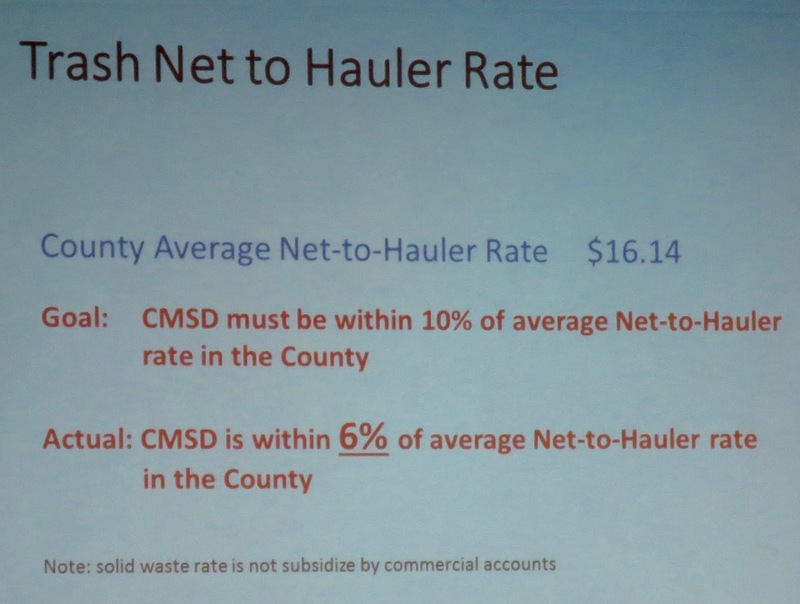 He told us it took CR&R six years to build their facility, which just opened a few months ago, and that CMSD was ahead of the curve on using it and received a significant rate reduction because we dove in first. 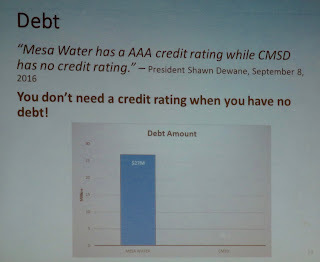 Ann Morrow stepped up and complimented Scheafer and the Board on the operations and the timely customer service. 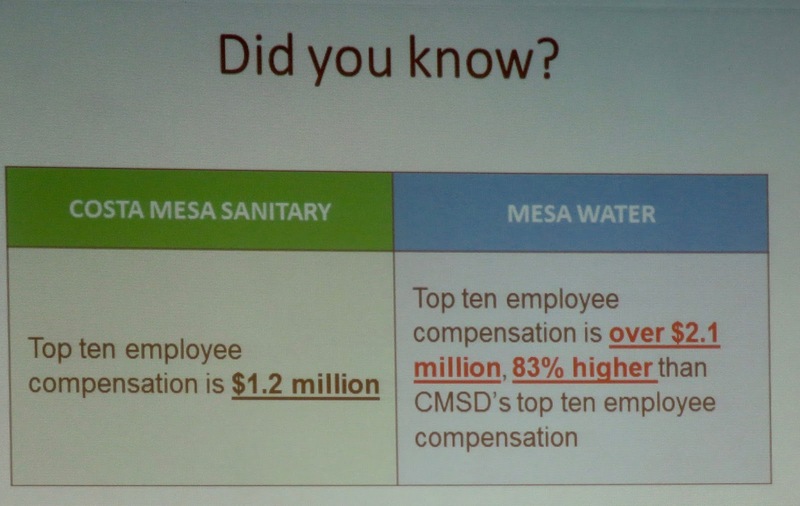 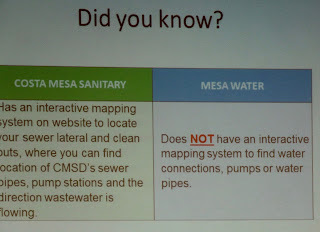 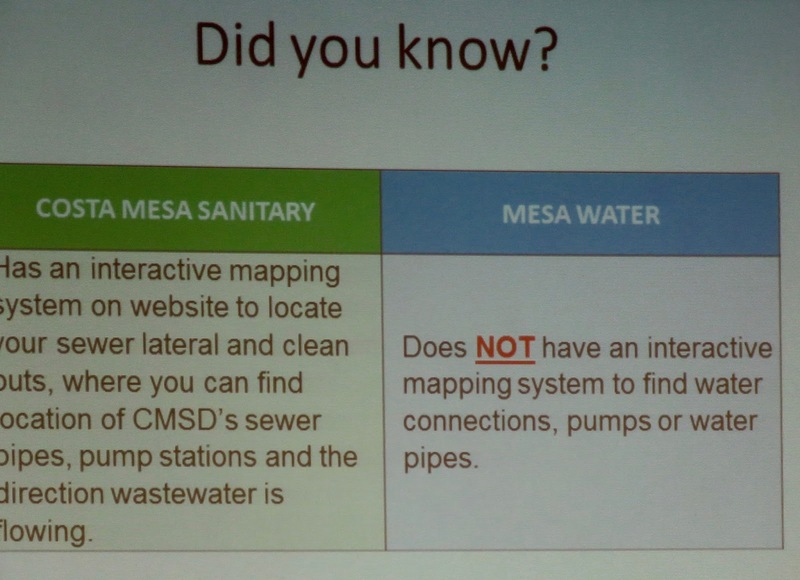 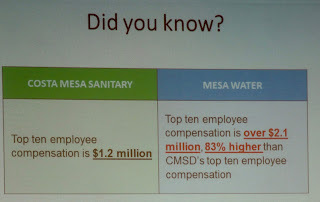 Lance Halestone wondered if the CMSD will offer classes on their processes as Mesa Water does. 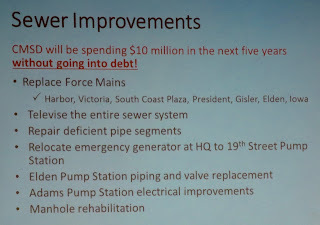 Scheafer told him it was in the works. 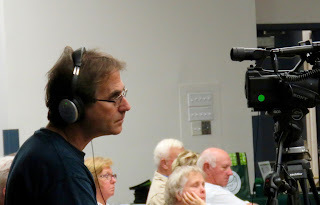 Barry Friedland was on-hand with his Costa Mesa Brief cameras to record the event. 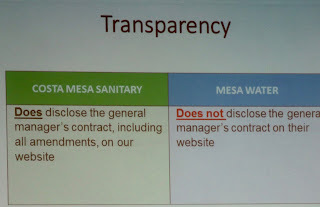 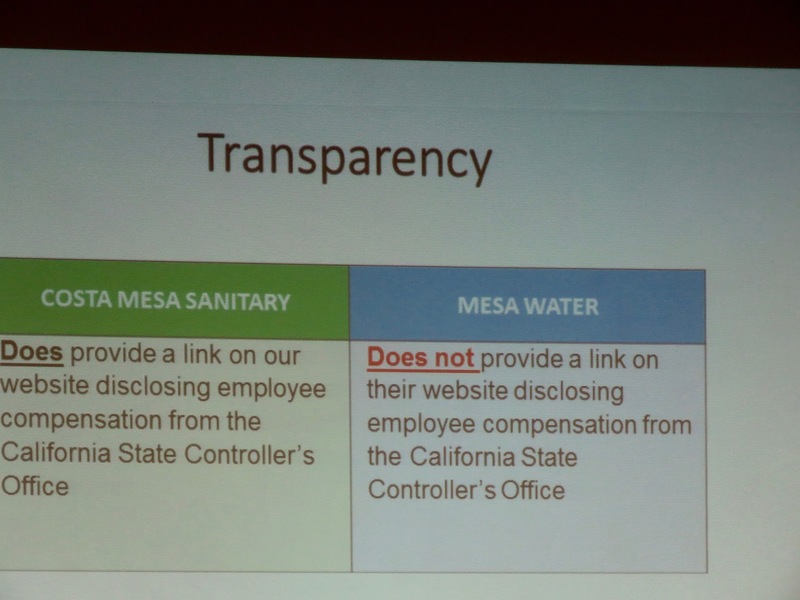 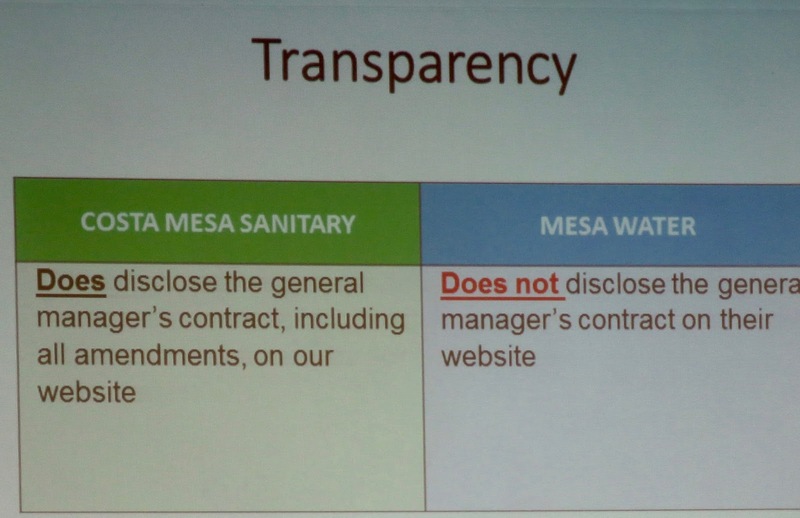 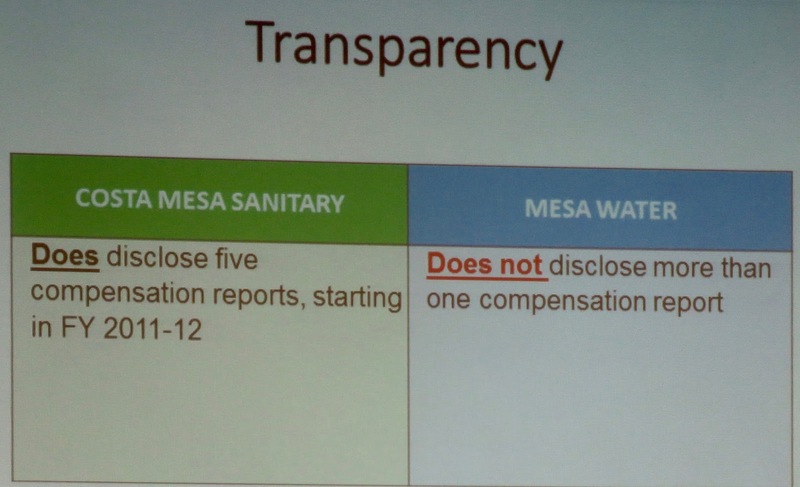 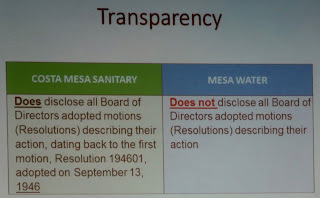 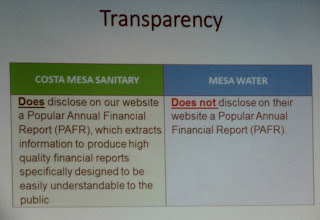 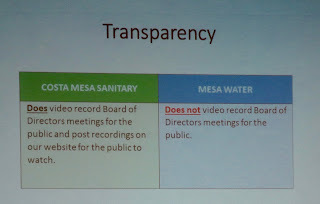 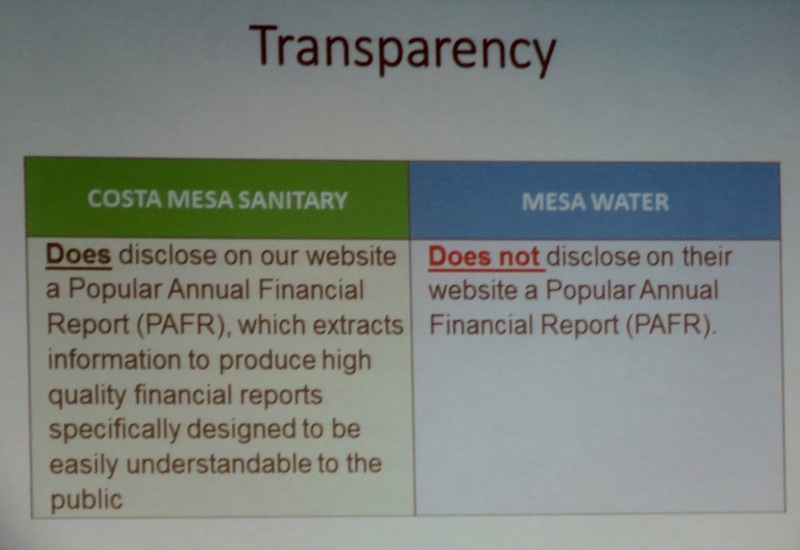 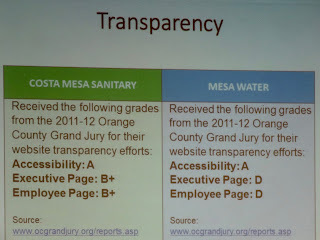 Scheafer also told us that Mesa Water had dispatched someone to tape the presentation - the fellow never took the lens off Scheafer the entire time - despite the fact that Mesa Water does not record their meetings. 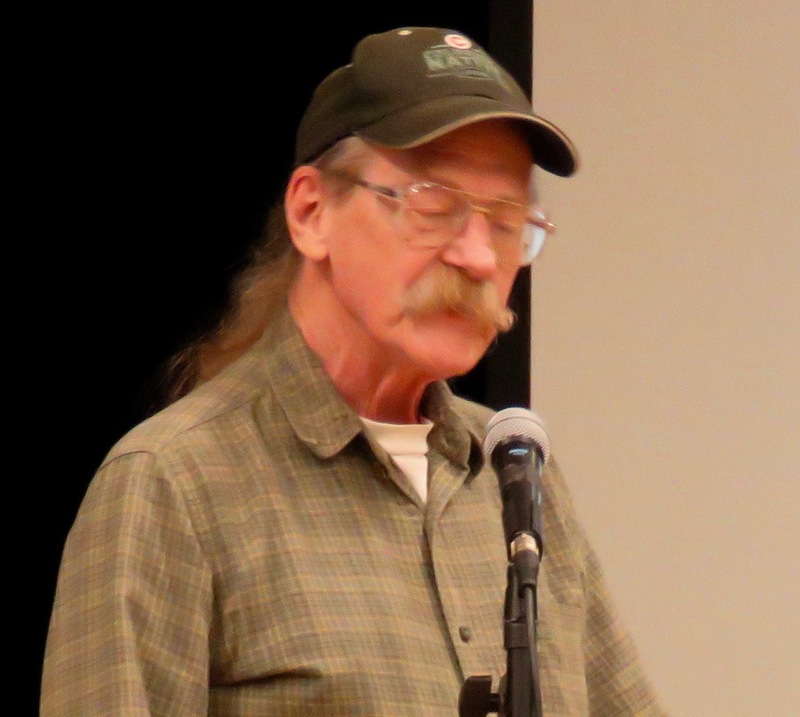 He thought it was amusing - and many of us also thought it was peculiar. 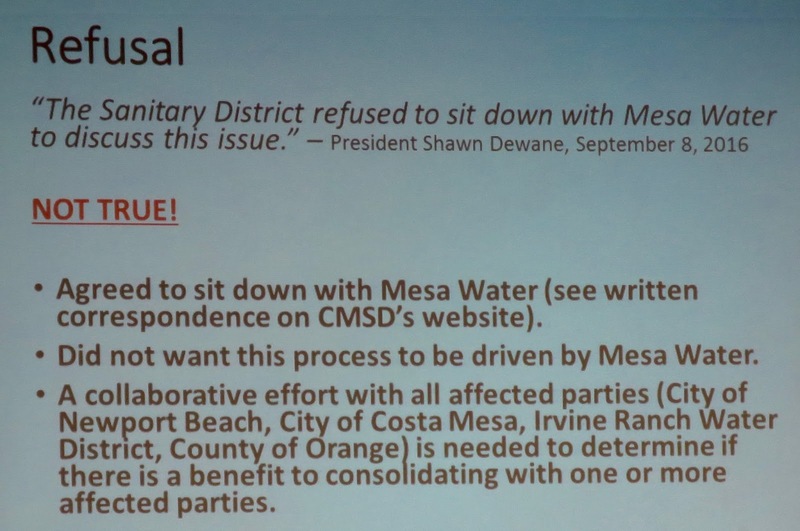 I'll post the link to this meeting when it becomes available - probably sometime next week. 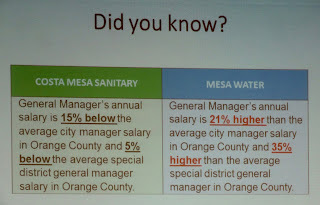 So, Vote NO on Measure TT and re-elect CMSD Board members Jim Ferryman and Art Perry to maintain the solid, professional leadership under which the CMSD has continued to be an excellent special district.